If you thought that FRENCH TOAST isn’t anything new, inventive and it just can’t get any better, you’re SOOOOO wrong! 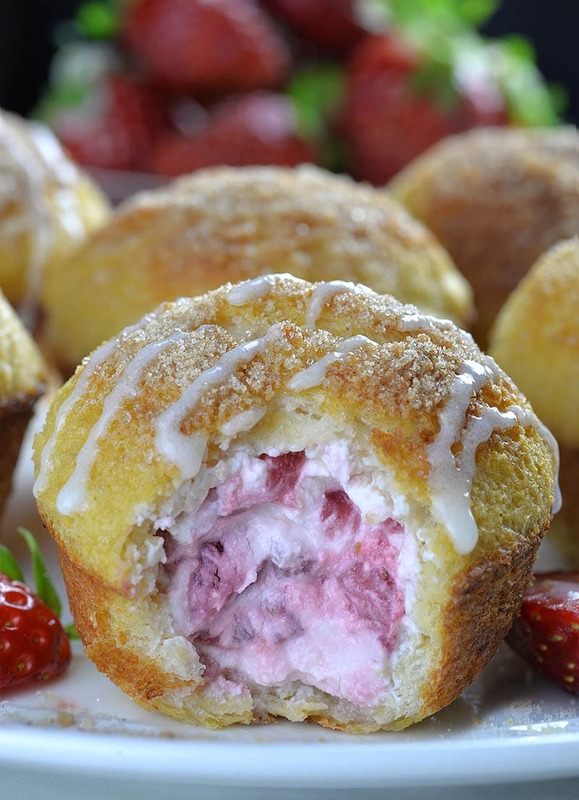 You should try these Cream Cheese Strawberry French Toast Muffins, then you’ll know what I’m talking about! French Toast Muffins stuffed with lots of fresh strawberries and a lots of cream cheese are both fun to make and even more fun to eat! Perfect breakfast idea for weekend breakfast! French toast is classic. I don’t know a single person who doesn’t enjoy basic French toast. Because French toast is comfort food at its finest. But I like to play with different shapes and sizes of bread to make it more interesting, too. Maybe you remember my French Toast Churro Bites. I cut bread with heart shape cookie cutter to make fun Valentine’s Cupid approved breakfast. Also, I can’t resist delicious Stuffed French Toast. French Toast Roll Ups are my favorite, especially with Nutella, like these Nutella French Toast Roll Ups. I like to add cream cheese and berries in my French Toast, too. If you like it too, then check these “ Imperfectly Perfect” Blueberry French Toast Roll Ups. Stuffed French Toast with lots of berries and lots of cream cheese is ABSOLUTELY PERFECT, warm and comforting breakfast! And I couldn’t resist to try a new way to make this delicious combo, so I go with muffins this time. 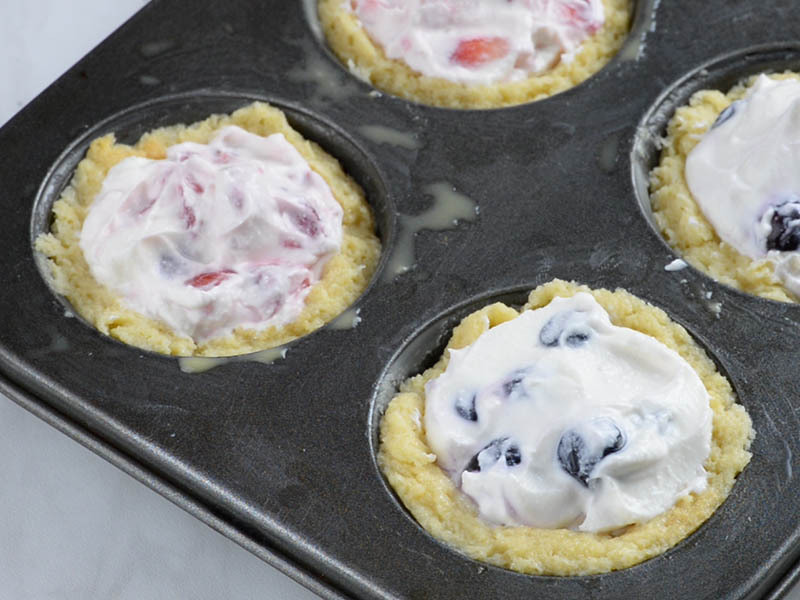 These Muffins stuffed with cream cheese and fresh strawberries (or blueberries) are delicious, soft, creamy and crisp at the same time. Howewer, perfect stuffed French toast, if you asked me. Take a day or two old bread and dip in egg custard, then place some butter in a pan and bake the bread. You are all probably familiar with this classic way to make French toast. But way not try something new and interesting. 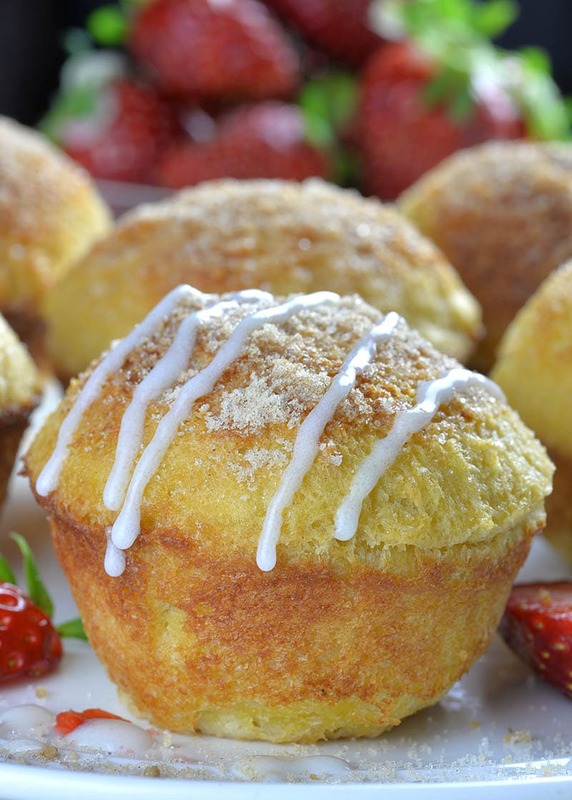 If you hate to stand over the stove top and cook French toast for whole family, and the casserole version of French toast is also become boring to you, then you should make this Cream Cheese Strawberry French Toast Muffins recipe. These are not classic French toast muffins with cubes of bread arranged in muffin pan and poured with egg custard. Although, it’s very delicious too, these Cream Cheese Strawberry French Toast Muffins are making in totally different way. These muffins are made of two circles cut out from slices of bread. Dip the bread in egg custard, use one circle to make bottom and sides of muffin, stuff with lots of cream cheese and fresh strawberry mixture, top with another circle of bread, sprinkle cinnamon-sugar on top and pop in the oven to bake for 25 minutes. After that you’ll have the best French Toast for breakfast, you’ve ever tried. Crisp and soft, at the same time plus a lot of sweet and creamy filling that burst of fresh berries. French Toast Muffins stuffed with cream cheese and fresh strawberries (or blueberries) are delicious, soft, creamy and crisp at the same time. Preheat the oven to 350F. 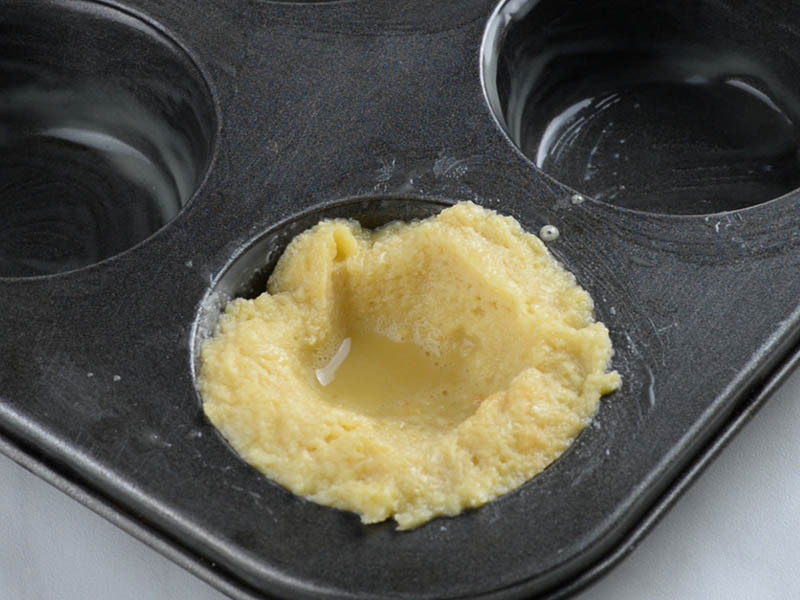 Brush cupcake pan with melted butter and set aside. This recipe makes 6 muffins. Using 4-inch round cookie cutter cut out the center of 6 slices of bread. Using 3-inches cookie cutter cut out remaining 6 slices of bread for tops. 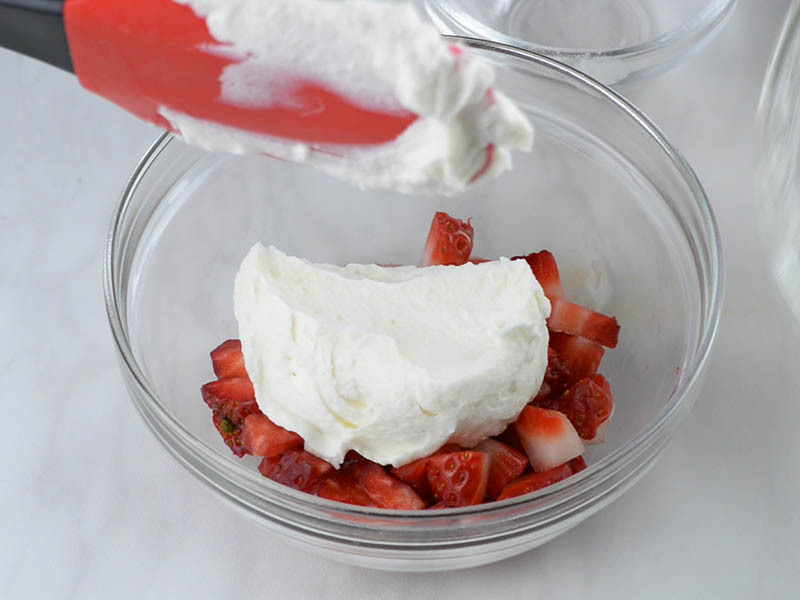 To make the filling stir together cream cheese, sour cream, vanilla and sugar until smooth. Fold in the fruit, set aside. In another bowl whisk together eggs, milk, 1 Tbsp. brown sugar and vanilla. Dip 4-inches round of bread in the egg mixture, then press into the center of a cupcake cavity. Repeat with remaining rounds. Divide the filling between the cups. 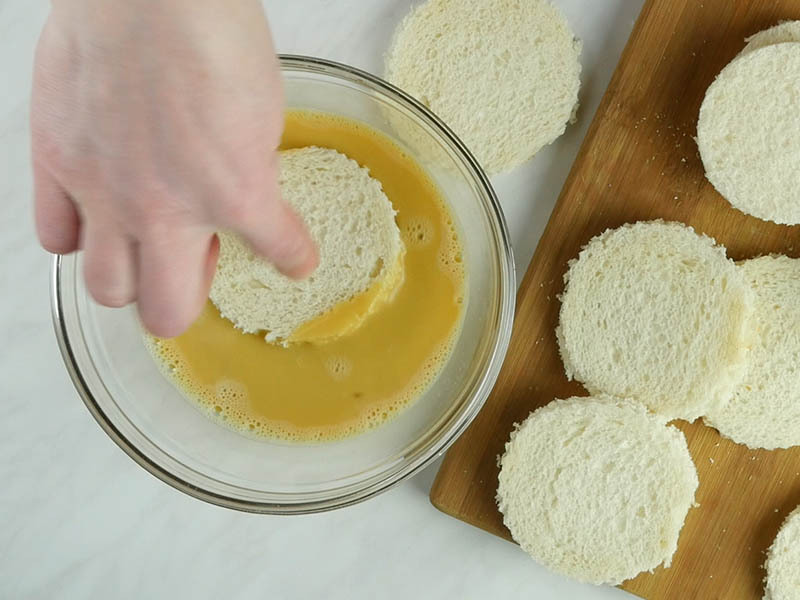 Now use 3-inches circle of bread, dip in egg mixture and place on top of the filling. Gently press the edges to adhere and press into the sides of the pan. Seal it well. Mix ¼ cup of brown sugar with cinnamon and sprinkle generously on top of each muffin. Bake for about 25 minutes until golden brown and crisp on top. Let it cool in the pan for 5-10 minutes, then remove from the pan and serve. If the muffins are slightly stick to the pan, run a thin knife around each muffin. To make the glaze, stir powdered sugar and milk. If it’s too thick add more milk, and if it’s too thin add more powdered sugar to reach desired consistency. Drizzle over the muffins. OMG, my kids and grand-daughter gobbeled them right up. Good thing had another pan in oven. Not as pretty as yours but there wasn’t any complaints….LOL their mouths were full so they couldn’t say much..LOL. A Big hit with them..Will make them again and again. I give this a 5- Star Rating.. This looks delicious and I am certainly going to give this recipe a try. Do these muffins store well? My guess is they need refrigeration. Hi! These sound fab! Can I make them the night before and reheat in the morning, or is this something that is best fresh? Please advise? Thanks! Hi Jill, we eat them fresh, but I think you could reheat them.